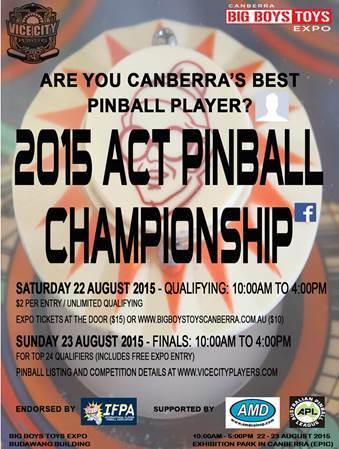 Are YOU Canberra’s best pinball player? 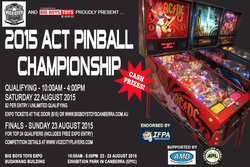 The inaugural ACT Pinball Championship is coming up this weekend at Exhibition Park In Canberra (EPIC). Qualifying commences Saturday week (22nd of August) from 10:00am and continues until 4:00pm. The top 2 highest scoring players on each of the 12 qualifying pinball machines will go through to the finals the next day. You can buy tickets to the Big Boys Toys Expo online for $10 at http://www.bigboystoyscanberra.com.au/tickets.html or for $15 at the door. After that, it’s $2 per game to compete on any of the 12 qualifying pins. More information, competition details, and a listing of the machines can be found at http://vicecityplayers.com/. This is more of what this city needs! Our inaugural ACT Pinball Champion is local player Peter Foster. The event was a great success with 75 tournament entrants raising $1000 which was used as prize money. Our free play machines were popular with families of new players and others reliving memories of days gone. After 3 months of preparation and 3 long days of work all our volunteers are pretty weary but feeling happy. Hopefully that the event can be staged again next year. and Canberra’s ONLY regular meeting Pinball/ retro Arcade gaming group- the Vice City Players.